...Friday night instead of going out, we stayed in and watched Groundhog Day. I haven't seen it before (have you?) but it was pretty good. I must be finally catching up on my Bill Murray movies because this summer I saw The Man Who Knew Too Little for the first time too and thought it was hilarious. 90s movies are the best. Hi, Cherry Blossom lead me to your blog and what did I see? Groundhog day! So funny, love that movie. He's the best. My fav B.M. movie is 'What About Bob' and of course the Wes Anderson flicks he's been in. 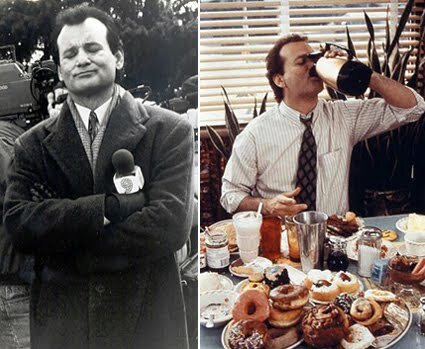 i love bill murray and groundhog day is one of his best. hello Alli, thanks for your sweet comment on the blog. love your posts, love your mind on this blog, love your shop! ah, an eminently quotable movie! one of my favorites! Hi and Happy Birthday to you! Thanks for your best wishes yesterday. Cool we are Scorpions both of us :) That rocks! Wish you a super day! I went to see soul concert at the classic APOLLO in Barcelona. Yeah! I actually haven't seen this one either yet! I need to because my husband loves Bill Murray movies. The Man Who Knew to Little is hilarious.